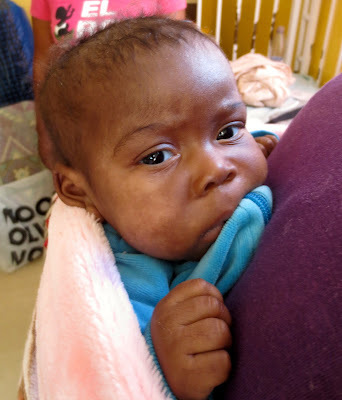 This week we picked up a baby from the hospital who had been there for a month. Today is her FIRST birthday, but her first 365 days have not been good. She weighed 4.86 KG (10.7 pounds) when we got her two days ago. Stop and think about that for a minute. Happy 1st Birthday Princess. Welili and Helen had to hold her up, but she got her first cake! In addition, she is HIV positive, has Tuberculosis, can't sit or crawl and was in the hospital for severe malnutrition. Her mother is 19-years old and also has a 3-year old who lives with the Grandmother. The young mother couldn’t care for the baby and begged the Doctor/nurses/social workers to find someone who would take her baby (and take some of her problems away). Social Welfare did their investigation, court orders were signed and we were called to pick up the child. Her name is Princess. When we went to pick the baby up “coincidentally” Anthony Mutua (a Project Canaan Supervisor who is currently studying nursing in Mbabane) was Interning at that very hospital and met us at the front door. He was able to help with language, care instruction and details that the nurses wanted us to know upon discharge. As we left the hospital we passed an old man and woman sitting outside the ambulance entrance area. He was in a broken wheelchair and she was sitting on the ground. Princess’ mom was walking out with us and she greeted the couple as we walked by. “Coincidentally”, they were her very own Grandparents, and they live in Sigceneni , the community right next to Project Canaan. In fact, they are Baby Princess’ Great Grandparents! We discovered that they had been sitting outside for the past 24 hours, hoping that someone would give them a ride home or money to take public transportation. The temperature dropped to 10C (50F) the night before and this couple sat through it, hoping for a good Samaritan to come by and help. The man is 90-years old and his young wife is 67-years old. I have masked their faces to maintain their privacy (sometimes my blog is posted in the national newspaper here). The Grandfather was trying to show me the tube coming out of his stomach when I was trying to take the family photo. My little car was full with 3 adults, one baby and $900 of children’s clothes that I had just purchased with Sharla and Scott Miller so we were not in a position to drive them home, but there is no way we could leave them there shivering. “Coincidently” at that very moment a van pulled up beside us and it had a sign that said Good Samaritan 911 on the side. 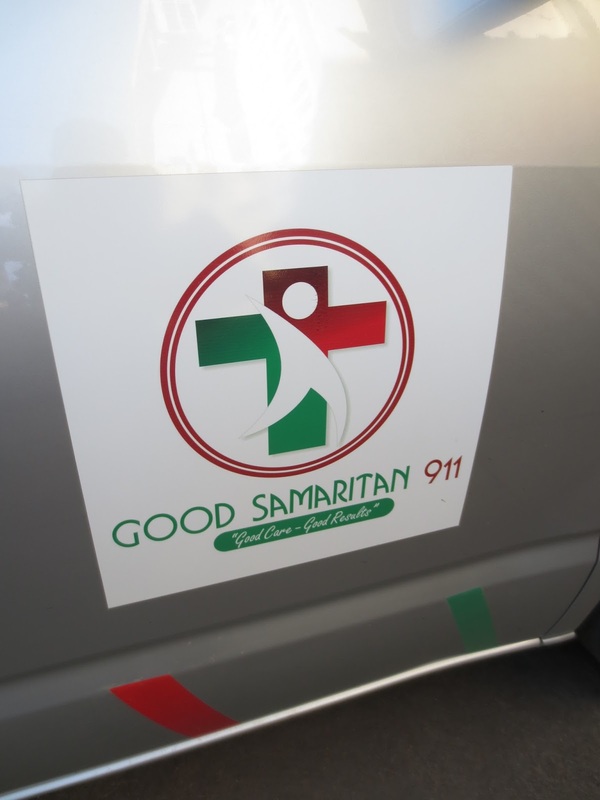 I immediately asked the driver what Good Samaritan 911 was and he said it was a private ambulance service that had just started. I asked him how much it would cost to take this man in the wheelchair and his wife to Sigceneni and he told me R450 ($37 US). SOLD! I pulled out my Compassion Purse, the Scotts handed me some money and between the two we hired the private ambulance to take this poor couple home. An hour later the ambulance driver called me to say that they had been delivered safe and sound. Every Saturday I have a list of things for Anthony to do when he comes home from Nursing School for the weekend. Most of is work in the community surrounding Project Canaan. Today Anthony was to take Alyssa Yount and her mom Debbie out for a homestead visit. Anthony asked one of our workers to choose a family since he would not be home until Saturday. I then asked him to go and check on the old couple after he did that homestead visit and take them some food. As I am writing this blog I got a call from Chris Cheek (who went with Anthony and the ladies). Guess what? “Coincidentally” the homestead that was chosen by another worker is the homestead of the Grandparents, and it is the homestead where Baby Princess’ older sister lives with their Grandmother. Back to Baby Princess. Unfortunately, when we go her home we discovered she had a fever of 41C (105.7F), she was severely dehydrated and she had pneumonia. “Coincidently” we have a Pediatric nurse (Camille Vincent) here volunteering for 7 weeks and she was able to move in to action and put an IV in the tiny baby and start antibiotics and re-hydration. Camille saved us an emergency drive back to the hospital and perhaps even saved Princess’ life. Every day we see miracles here, and the “coincidences” are too many to write about. But today I thought I would share just one small story of what I believe is not coincidence, but the mighty hand of God. Live from Swaziland … I believe in God-incidences, not coincidences. PS – Did I mention that when I asked Chris Cheek to go with Anthony to visit the Grandfather and Mother in Sigceneni today I sent her the photo of the couple so that she would know who she was looking for. Chris texted me immediately to say that she had actually MET that old couple in 2013 when she first came to Swaziland, and then she sent me this photo of her and the couple from 2013. The hand of God. Chris and Princess' Great Grandparents in 2013. Baby River is home (after 7 surgery’s and 3 colostomies)!! The whole story. 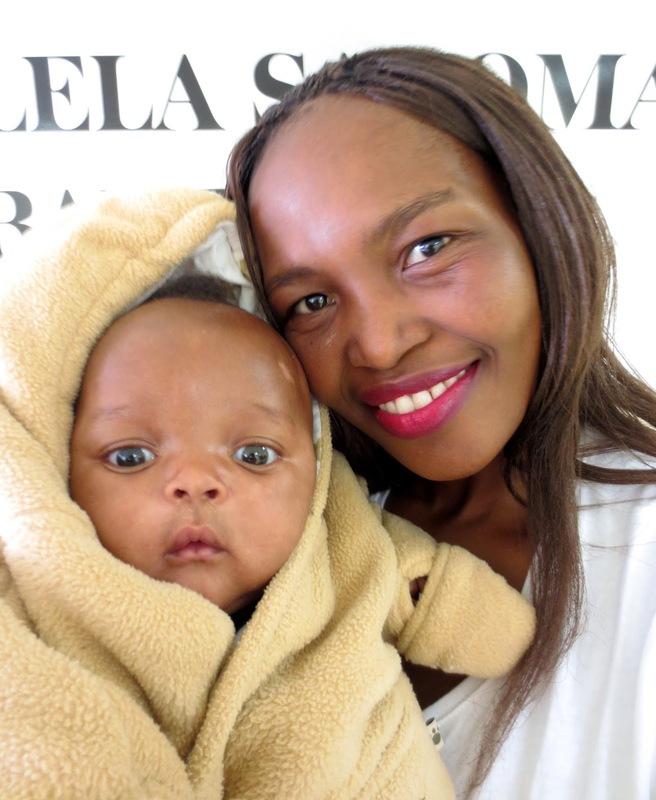 Thank you Zodwa for spending a month in the hospital with River! On March 3, 2015 a woman gave birth to a baby boy, put him in a plastic bag and dumped him on the side of a river. We don’t know how long the newborn was there, but it was long enough for river crabs to eat through the bag and through his tender skin to make a huge hole in his bottom. The wound looked as if rats had burrowed a hole in his tiny body. Eventually a passerby heard the cries of the child and called the police. The police took the baby to the hospital were a surgeon quickly attended to the wound and did a “double barrel” colostomy (surgery #1) to help the wound heal without infection. A week or so later we were called to come and pick up the child, now known as “Baby River”. He came to the El Roi Baby home and under the care of our amazing medical and caregiver team his wound was healed in a few short weeks. He was returned to the hospital to have his colostomy reversed (surgery #2). That surgery seemed to go as planned, but then something went terribly wrong. I will do my best to explain to the best of my knowledge and ability (and lack of medical education) what happened in the days and weeks after that. · The reversal did not heal and there was a leak in to his abdomen. · Emergency surgery was done (surgery #3), his belly opened up and abdomen cleaned. At that time they attempted to complete the colostomy reversal again. · More infection came and another emergency surgery (surgery #4) was done to find the leak, clean the abdomen and put in a new colostomy (colostomy #2) to reduce infection and help with the healing. 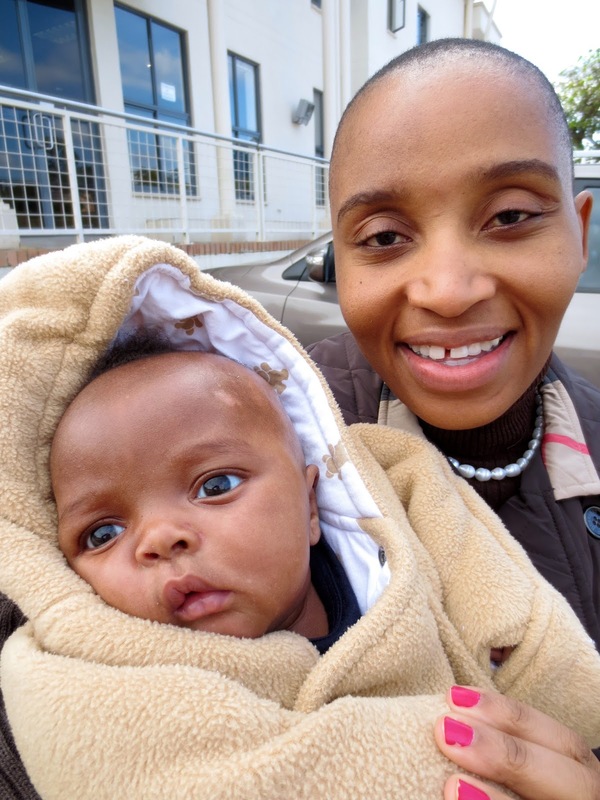 · Immediately following that surgery we decided to move the baby by ambulance to a private hospital in Manzini. · Baby’s overall health continued to fail and within a couple of days his oxygen levels dropped to 40%, the infection had spread to his bloodstream (sepsis) and early one morning he crashed. · The Doctors sprung in to action, did CPR and intubated him (put him on a ventilator to breath for him) as his lungs had fluid around them and he couldn’t breathe. · Abdominal stitches were removed to allow his intestines and stomach to come out so that the pressure was taken off his lungs (not counted as a surgery) and fluid from lungs was removed with a syringe. · The next day surgery #5 took place and the surgeon found two perforations in his bowel, which is why stool was leaking into his abdomen for five days. · Surgery #6 the surgeon put the organs back in to his abdomen, but didn’t close him up. · Surgery #7 the surgeon put all of his organs back in and closed him up. · Once he was able to breathe ventilator removed as he was breathing on his own and he was moved to the ward. · TWO SHORT WEEKS later … he came home. That was today. All the nurses wanted to get a photo with the little miracle baby. Thank you Dr. Kunene, Dr. Okello and Brooke Sleeper for ALL you have done. In summary, River is now 3.5 months old. He has been dumped by his mother, eaten by crabs, has had 7 surgeries, 3 colostomies and is a miracle for the whole world to see. He gets lots of TLC for the next few months. At that point the #3 ostomy will be reversed (surgery #8). A few months after that, the #2 colostomy will also be reversed (surgery #9). Thank you all for your prayers, your love, your emails and your financial support. We will have the final “bill” on Monday, but we know that we owe many, many thousands of US dollars to the hospital and staff who saved this little ones life. We are incredibly thankful that there is such a hospital in Swaziland and people who work hand in hand with to do what some days seems impossible. We ALL saw the hand of God on this baby’s life, over and over again. There is no question that El Rofi saved this child and we look forward to watching him grow. Today, I am asking if you can help us pay his hospital bill. If you can give, please do. Live from Swaziland … so much to be thankful for. It’s been 10 years since our family has gone away on a vacation together and just had fun – no work, no meetings, just exploring, spending time together, eating, and of course, napping. We enjoyed all types of food from Taiwanese pot stickers to Vietnamese coffee (made with raw whipped egg yolk) to Balut (fertilized duck embryo – only Spencer tried that one) to drinks made with fresh cinnamon/cardamon & anise. The food highlight was definitely Thai cooking school on the Island of Koh Samui. 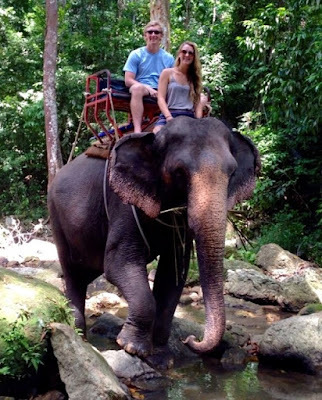 Our travel included many modes of transportation including planes, High Speed trains, ric shaws, tuk tuks, river boats, scooters, taxis and even elephants. Even on a trip of high adventure, there is no doubt that the best part was just having our whole family together again, on the same continent, in the same city and sleeping under the same roof. We laughed so hard that we almost, well, you know. We told and re-told family favorite stories (at the bequest of our children) and we all shared stories on how God has directed our lives in so many miraculous ways. At the end of each day we sat and looked at whatever view was in front of us and were in awe of the beauty of the world that our creator made. I love that our children notice sunsets and rainbows, the color of the ocean and the simple beauty in a flower. Friday night we made it home to Swaziland where we will continue our family time for the next 9 days. This blog is written in honor of my family and to give thanks for the time that we have had together. Live from Swaziland … I am a very happy and thankful mama. Labels: Taiwan, Thailand, vacation, Vietnam. I felt so guilty for so long. The sunset from our room tonight in Koh Samui, Thailand. When I first stepped foot on the African continent my life was changed forever. I distinctly remember thinking that I could not possibly pile presents under the Christmas tree as I had in past years for our young children (who didn’t “need” anything to start with). The thought of hanging hundreds of lights, decorating the house with expensive bobbles and piling our family table up with delicious and extravagant treats, when millions of children in Africa had NO food at all, just made me sick to my stomach. I couldn't face Christmas 2003 in my big, fancy home and instead our family went to a beach resort so I could escape (not that it was in any way cost saving!) and think about how I would change “Christmas-future” for the Maxwell family. After spending too much money on that trip to the beach I decided that I could never take a vacation again, while millions of children in Africa had no food. I am not saying that my thinking was sound, fair to the rest of the family or that I was trying to be a Super-Christian, I just felt guilty. Most of you know the story from my first book, “It’s Not Okay With Me”, but we made some major lifestyle changes that included everything from eating frozen pizza rather than ordering in, eliminating fancy vacations, getting rid of the nice cars and eventually, moved to Africa. Ian and I built a lovely home here in Swaziland, with funds that we had saved from our business days. It’s technically the property of Heart for Africa, but we live in it as the Directors of the project. I give thanks for the safety, beauty and comfort of this home every day, but there are days that I feel guilty for living in such a lovely place when I have visited homes where the roofs have gaping holes and the mud walls are collapsing. Holidays are another source of guilt for me, and that leads me to this week’s blog. During our business days our family used to go on great holidays to the beach, or exotic destinations, but we stopped doing that in 2003 after “Africa” happened to me. I could not justify spending money for four of us to fly somewhere and just have fun. But then time passed, life continued, our family lives on three different continents and I realized we are missing out on family time, memory making and renewal of spirit. So I am trying an experiment. Last week Spencer, Ian and I flew to Taiwan to attend Chloe’s High School graduation. After a few whirlwind days in Taiwan we headed to Vietnam to visit the place where our friend/hero/favorite Uncle, Captain Jerry Coffee, was a POW for 7-years. I am so glad we made the decision to visit this incredibly important place and learn more about the history of this part of the world. Chloe even spotted Jerry’s photo on the wall in what is left of the prison – a photo that Jerry himself had never seen. The visit had a significant impact on all of us. Ric shaw ride in Hanoi, Vietnam. 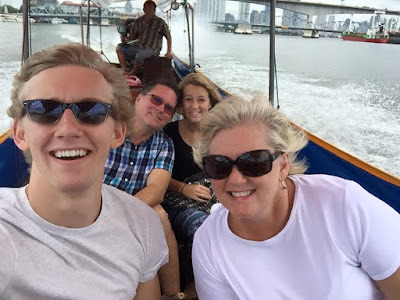 Last night we started a weekend of celebration for Spencer’s 21st birthday in Bangkok, Thailand. We were stunned by the view at “Skybar” on a rooftop made famous by the movie Hangover II (I debated telling you that part). The view was breathtaking, spectacular and left us all speechless (which doesn’t happen much in our family!). Today we flew to the Island of Koh Samui in the southern part of Thailand. The sun has already set as I sit and write this blog, and it is 9PM in Thailand, 3PM in Swaziland and 9AM in Georgia. We are watching “Anna and the King” as we continue to learn about, and embrace Thai history and culture. I have no words to explain how awesome this time is together. We are having fun as a family. We are learning and growing and laughing and eating and enjoying each other’s company. In a week we will all be back in Swaziland for 10 days, and then Spencer heads back to Georgia and Chloe goes to Canada. Everyone is back to “real life”. We don’t know if and when we will have an opportunity to be together again, but today we give thanks. I might still feel pangs of guilt (I cannot say that I don’t), but I am giving thanks in a VERY BIG WAY for the ability to enjoy this time as a family and for His provision. Live from Thailand … I have a good life. Labels: Family, guilt, holidays, Thailand, Vietnam.